Whatever your age, setting up a my Social Security account is a great idea. Especially if you hate the long lines at the Social Security office! It’s really easy too. 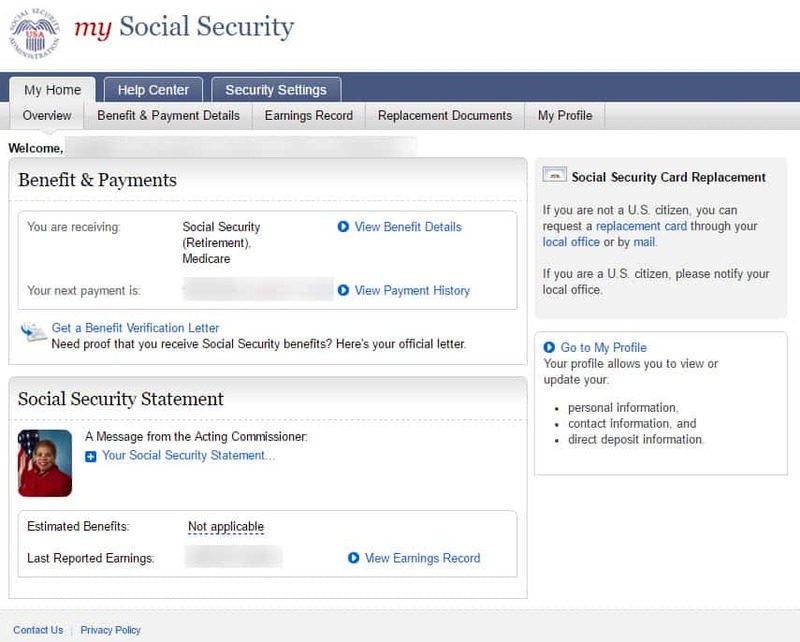 From the comfort of your sofa you can go the Social Security sign in page and conduct business that would otherwise require a trip to the SSA office. Also, the information available in your online Social Security account is critical for sound retirement planning. So if you haven’t already claimed your account, you should today! Here are a few things you’ll be able to do once you sign up. If all of those reasons aren’t enough to convince you to set up your online account today, consider this: For every day that goes by without YOU setting up your online account, your chances increase that someone else will! If for no other reason, do it to keep yourself protected! 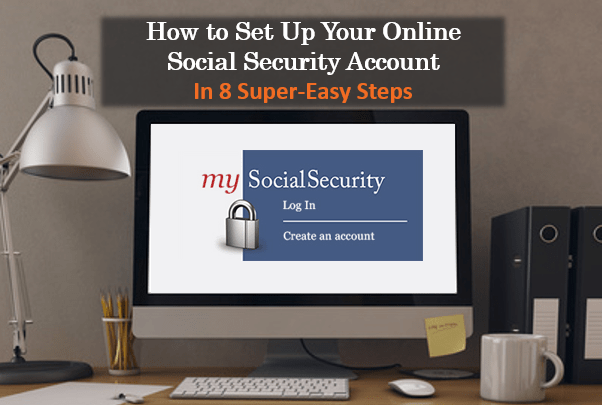 Setting up your my SSA account is really simple. In fact, I can show you how in 8 super-easy steps. 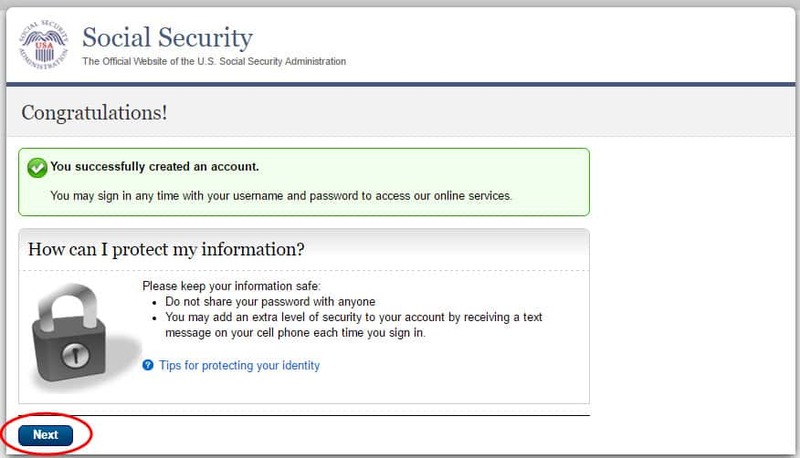 Visit the Social Security sign in page at www.ssa.gov/myaccount. Feel free to click the link. It will open in a separate page so you can follow along. On the next page you’ll want to read the information carefully before you click “Create An Account.” It discusses the information you’ll need to have handy in order to set up the account. It also makes it clear that you can only set up your own personal account for your exclusive use. Although you need to understand this information for yourself, here’s a summary of what you are agreeing to. -You understand that the Social Security Administration uses a credit reporting agency to verify your information when you are opening this account. In order to verify your information, they must make a “soft” inquiry on your credit report. This soft inquiry should not affect your credit score. 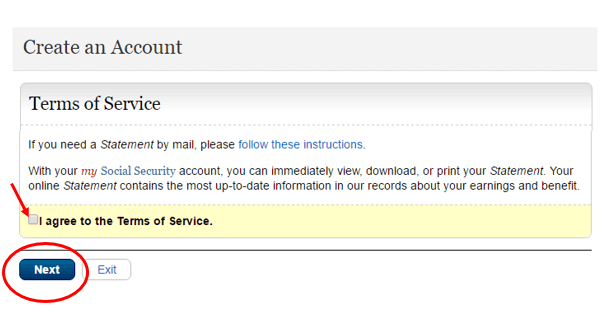 -Once you open an account, you will no longer receive an paper statement in the mail. Instead, you’ll receive an annual email reminding you to login and check your information. Now it’s time to start verifying your identity. You’ll need to fill in your name, SSN, birthdate, address and phone number. All of this information needs to be an exact match to what’s found on the Social Security records. Once you have completed filling in this information, simply click “Next” to proceed to the next screen. In step five, you’ll have to answer some questions that have been generated to help secure your identity. Beware! Not all of these questions are legitimate. They may ask you about a mortgage that you opened in a year where you never had a mortgage. Don’t hesitate to click “none of the above” if you don’t recognize the information. If you get some of this information incorrect, don’t be surprised if they make you wait 24 hours before trying again. If that happens to you, don’t give up! Come back and try again. Most likely, they’ll ask you a different set of questions in your next attempt. You’re almost there! Now you just need to create a username and password. 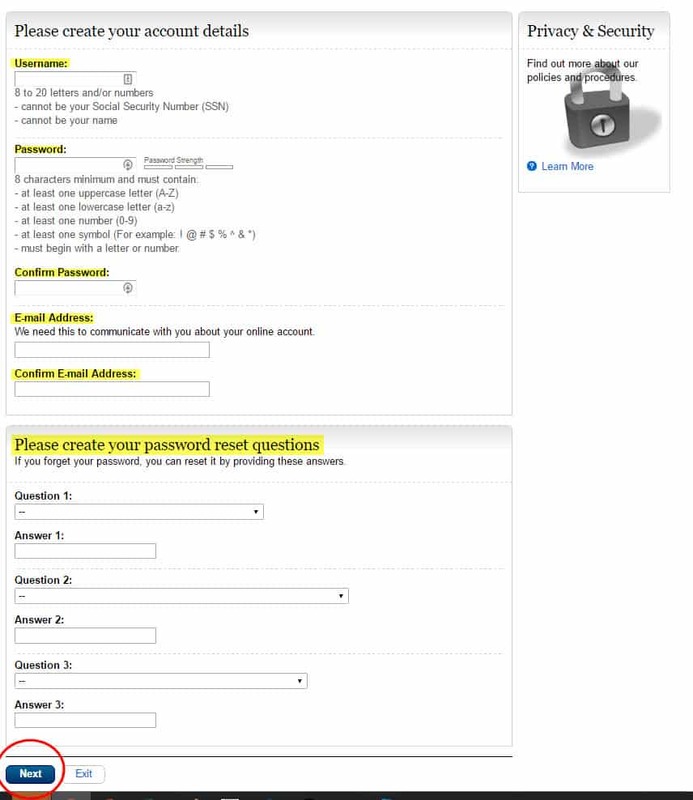 When creating a username, you cannot use your name or SSN. While it may not be as important as your password, you should still choose a username that is unique and not easily guessed. Additionally, it must begin with a letter or number. Choosing a strong password is really important. I personally follow the advice like you’ll find in this article at Lifehacker. After you choose your username and password, you’ll just need to provide them with a good email address. Remember that your statements will cease and you’ll just get an annual reminder email, so be sure and use an email address that you check regularly. In the second part of this page you’ll need to select answers to some questions in case you ever need to reset your password. Once that is finished up, you’re ready to click “Next” and move on to the next page. Congratulations! You’ve set your account up. That was easy wasn’t it? 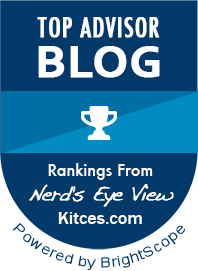 I know it’s tempting to start navigating around, but if you are visiting this page for the first time, I’d highly recommend bookmarking this site. 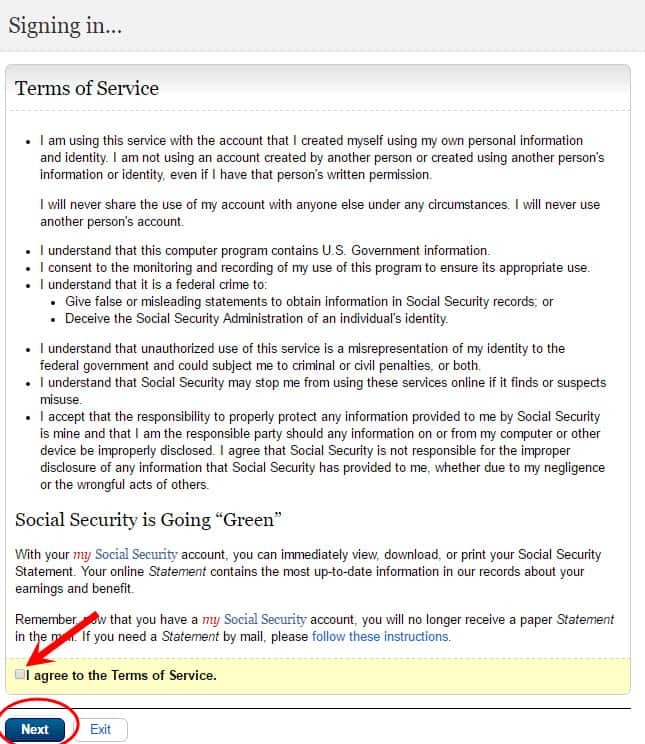 With all of the different SOcial Security pages, it can be difficult to find the right Social Security sign in page. 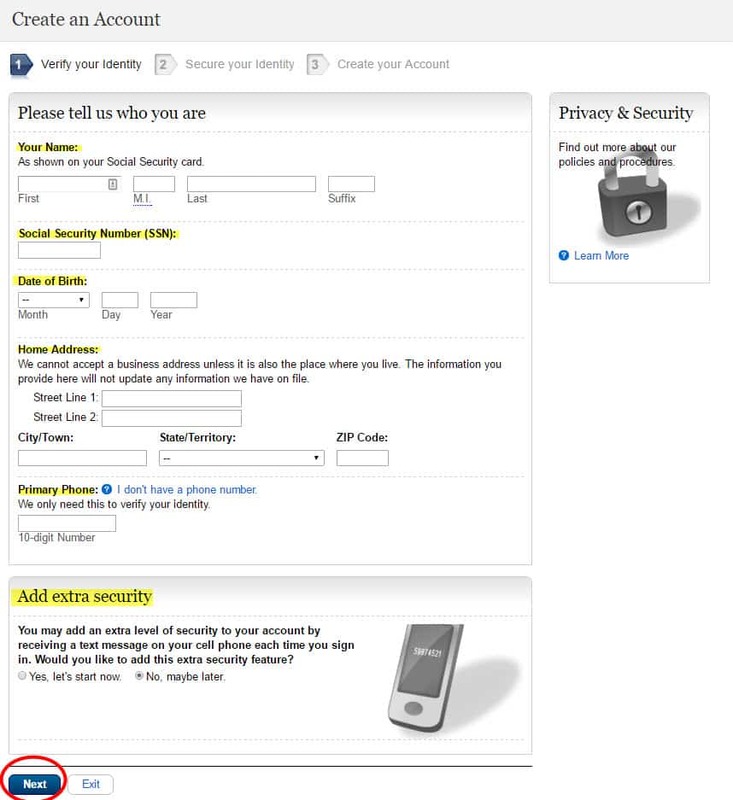 Just name it “online social security account” or “social security sign in.” This will make it much easier the next time you visit. Now that you’ve bookmarked it, you’re ready to start using your online account. 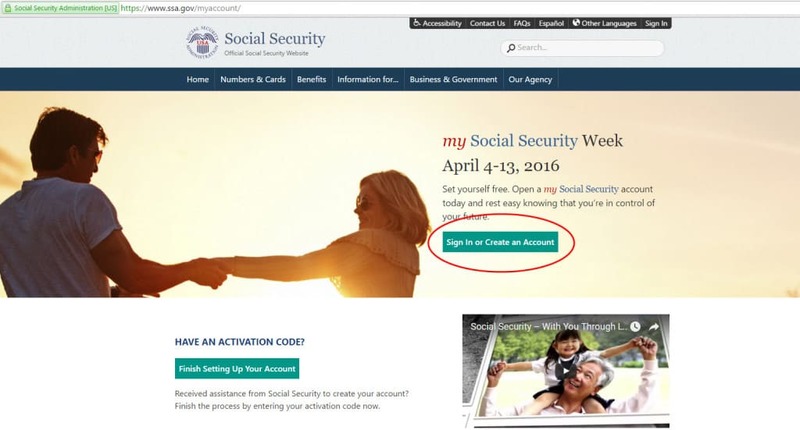 You should still be on the home screen and looking at an overview of your personal Social Security account. This is your “snapshot” page that shows things such as which benefits you are currently receiving and when your next payment will be made. This page is also your launching point for doing lots of other stuff. In the Benefit & Payment Details tab you can view historical payment amounts and view what’s being deducted from your Social Security check. In the Earnings Record tab you can verify whether or not the earnings are correct. I highly encourage you to do this since your benefit amount is based on historical earnings. In the Replacement Documents tab you can request a Medicare card replacement and instantly print your SSA-1099 along with a few other documents. In the My Profile tab you will be able to update your address, phone number, email, and direct deposit information. 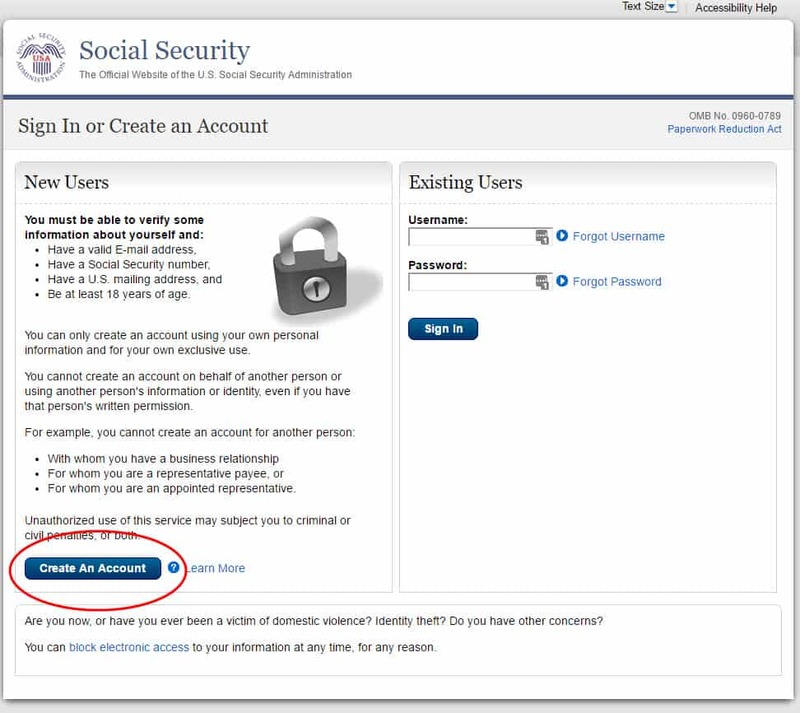 I hope this guide was helpful in setting up your online Social Security account. Here’s how you can help me. If you see a screen in the your signup process that is materially different than one that you saw in this how-to guide…please let me know. Otherwise, good luck in your quest to become more informed about your Social Security options! If I can be of assistance, please don’t hesitate to contact me. 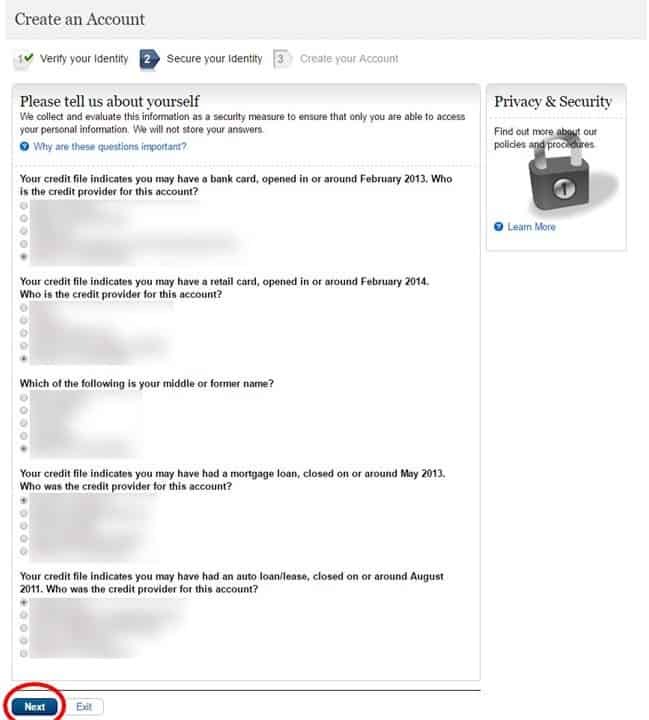 The info in a credit report is NOT a secure form of identification. Do you recommend setting up an account for a disabled minor child? Ot deceased spouse? SS is giving my mom are hard time. For example, they won’t print off my dads earnings record so that she can make decisions. This article does not address the steps necessary to access your account if you can’t get beyond the security questions. There are ways to do it, but the screen has the prompts to follow. In an era of so much identity theft, I’d rather not unknowingly assist anyone in improper access of personally identifiable information. These steps do not work! If you have a credit freeze on your credit reporting agency accounts, you won’t get past the page with your initial info (name, SSAN, etc.). If you are able to get to the questions, they are ridiculously in error and you will NEVER get them right.